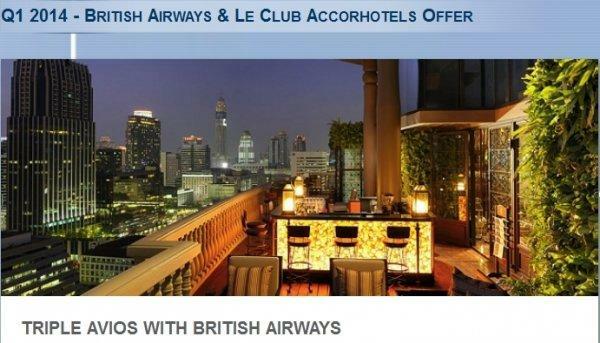 Le Club Accorhotels has a new promotion for triple British Airways Avios for stays between January 1 and March 31, 2014. You need to have British Airways Avios as your earning preference and have the auto-deposit enabled. You can read more about how to enable this target=”_blank”>here . There is no need to register for this promotion, but you can access Le Club Accorhotels web page for this promotion here . Note that this offer is only for British Airways Avios and not Iberia. Le Club Accorhotels tend to have these triple miles offer for British Airways and Iberia every few months. You can always earn British Airways Avios and later move them to Iberia Plus (if you prefer Iberia variant). * This promotion is only open to Eligible Participants. An Eligible Participant is a person aged 18 or over and is a current British Airways Executive Club (“BAEC”) Member (membership terms and conditions apply). • To be eligible for this promotion, members must enrol with Le Club Accorhotels, and select British Airways Executive Club Avios as their earning preference. This must be selected prior to booking. All Le Club Accorhotels terms and conditions apply. For full terms and conditions click here. • Offer available for bookings made between 1 January 2014 and 31 March 2014 for stays from 1 January 2014 until the 31 March 2014 (“Promotional Period”) at participating Accor hotels only (“Participating Hotels”). All Accor hotels participate in this offer with the exception of certain hotels. For a list of non-participating hotels click here. • Triple Avios is applicable for stays booked and completed at any eligible rate. An Eligible booking rate includes all public, corporate and promotional rates, but NOT the following rates: room rates for business or leisure group reservations where the rooms are booked as part of a conference or an organised trip on a group account or settled globally (except Meeting Planner promotional offers); the “Partner Rates” tariff; room rates for crew (airline crew, shipping or other); the Accor employees’ rate and the rate for employees of partner companies and providers to the Accor Group; and tour operators rates. • A stay is defined as consecutive nights spent at the same Participating Hotel, i.e. from check-in to check-out irrespective of the length of stay. • Offer is subject to availability, advanced reservation is required. • Reservations can be made on accorhotels.com or the participating brand websites, or via the Accor Call Center – 0871 663 0624. (Calls cost 10p per minute plus network extras).